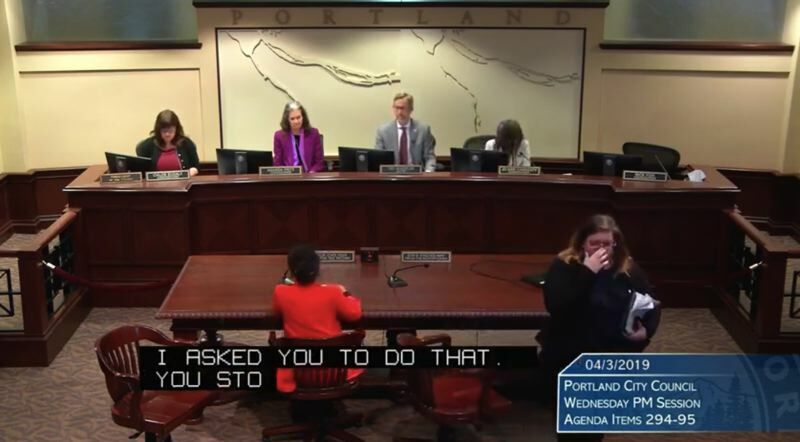 A heated debate at the Portland City Council last week left one speaker in tears, spurring a rebuke from the mayor over disrespectful behavior and subsequent accusations of racial double-standards from the community. It all began during a Wednesday, April 3, hearing regarding a rental ordinance proposed by Commissioner Chloe Eudaly, which would affect how landlords pick tenants and manage their units. 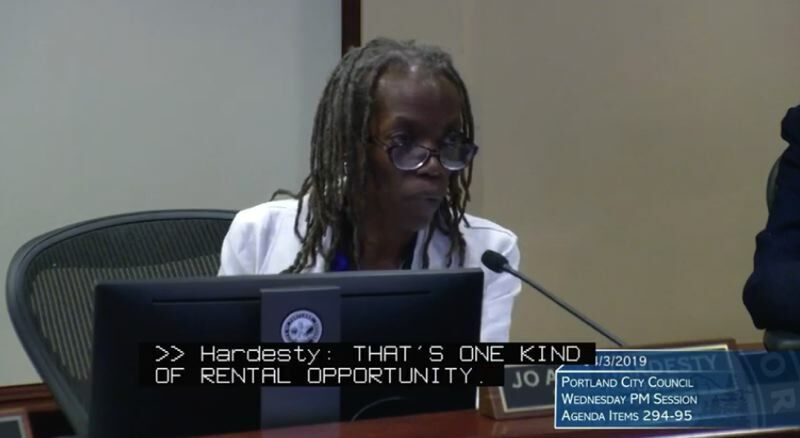 The council meeting had stretched into its third hour of testimony from a panel of five experts when Hardesty began to question Jessica Greenlee, an analyst for Affinity Property Management who sits on the city's rental services commission. Greenlee argued that the 33-page draft of the public policy was "not fully baked" and too confusing for mom-and-pop landlords. She said the rules might drive up the cost of housing and pushed back on provisions for prospective tenants lacking government ID. Commissioner Jo Ann Hardesty responded by saying that many community members don't have official ID. She offered, as a hypothetical example, her father, whom Hardesty said lacks a birth certificate because he was born a long time ago in a hospital that burned down. "If he just happened to be out there trying to get housing, I would like to know how you would help him get housing?" Hardesty asked. "But don't you think that responsibility lies in the public sector?" Greenlee responded. "You're trying to ask somebody who may only own one or two housing units to make determinations that are much more complex." Hardesty replied that Greenlee wasn't answering her question. "It was a real straight forward question — it didn't need all that gray area," she said. Greenlee began to audibly cry and soon left the dais. She apologized for the emotional display to a reporter from Oregon Public Broadcasting, saying she felt anxious speaking in public and didn't want to come back to the testimony table. Portland Mayor Wheeler interjected after the incident. "I don't care if people are for this or if they are against it," he said. "People here deserve to be treated with respect." Hardesty, who sits next to the mayor on the dais, began to lean away from Wheeler. That's when the accusations of race-related double standards began. Hardesty is African American. The Urban League of Portland contends that Wheeler stepped out of bounds, saying his response "illustrates yet another double standard to which Black people are held even in progressive Portland." "I know that part of the job is asking questions and engaging in discourse with Portlanders," wrote U.S. Congressman Earl Blumenauer, whose nine-year tenure on City Council ended in 1996. "From my vantage point, Commissioner Jo Ann Hardesty was doing her job and doing it well." In their statement, the Urban League pointed out that Wheeler didn't make similar calls for civility the next day, when several members of the public let loose tirades about Hardesty's behavior. The league also said Commissioner Eudaly, who is white, also asked tough questions, but was treated differently. In a statement, mayoral spokeswoman Eileen Park said Wheeler "acknowledges the criticism" and "will continue to consider race and gender dynamics" while managing meetings. "He will also continue to enforce the rules of order and decorum so that the public, city staff, and council members will all feel welcome, safe, and heard," Park wrote. Hardesty's chief of staff didn't respond to an email requesting further comment.